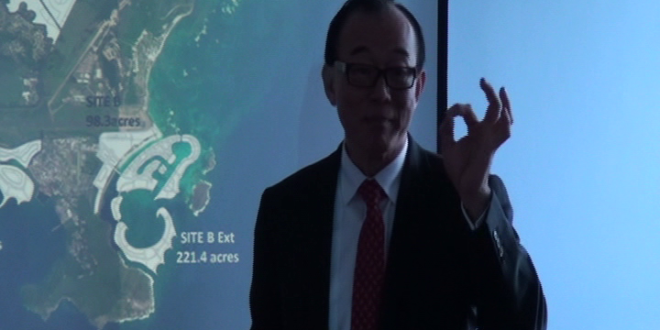 Chairman of Desert Star Holdings Ltd, Teo Ah Khing on May 10th unveiled a different version of proposed plans for the construction of a man-made causeway off the south east coast near Vieux-Fort. The previous ‘Southern Causeway’ initially presented by DSH, linked the mainland to the protected Maria Islands. 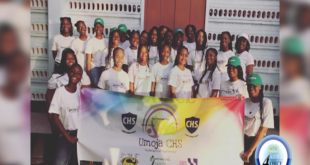 The DSH renderings sparked national debate and objection from various conservation and, environmental agencies including the Saint Lucia National Trust [SLNT] and civil society organizations. Maria Islands is managed by the SLNT and is home to five endemic reptilian species and rare flora specimens. The DSH Chairman presented to the press another reclamation project at the Office of the Prime Minister. The new DSH rendering is apparently redesigned and stops short approximately 200 metres away from the Maria Islands. 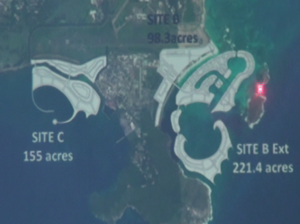 DSH Chairman Khing explained a beach will be developed along the coast of the redesigned causeway. 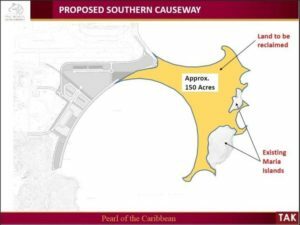 Prime Minister Allen Chastanet reaffirmed the initial DSH causeway plans were not finalized.The new DSH designs according to the Prime Minister, represents consideration for various environmental and ecological concerns. Listen below. 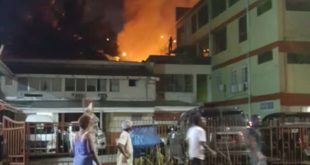 It is unclear whether the latest DSH causeway plans for south-east Vieux-Fort will stand. Save Our Sandy Beach, Vieux-Fort Concerned Citizens Coalition for Change [VF4Cs], I Will Stand, the SLNT and the Main Opposition Saint Lucia Labour Party have objected to the previous DSH causeway plans. Prime Minister Chastanet maintains only one phase of the multi-billion dollar DSH Agreement has been approved.